To illustrate the fundamentals of a DC resistivity survey, provide a vision for how it is applied in the field, and demonstrate potential uses. Variations in conductivity can be diagnostic, for example, when aiming to characterize a mineral deposit (e.g. Mt. Isa), where the conductivity of the mineralized zone is often higher than the host rock. In a Direct Current Resistivity (DCR) experiment, a generator is used to inject current into the earth. The current path depends upon the variation of conductivity or equivalently, its reciprocal, the electrical resistivity. Currents are channeled into good conductors and flow around resistors. Electrical charges are built up on interfaces that separate units of different conductivity and these charges generate an electric potential. Fig. 149 Direct Current Resisitivity (DCR) experiment showing current path and charge built up near a (a) conductive and (b) resistive anomaly. Data are acquired at the surface or in boreholes by measuring the potential difference between two electrodes. The measured voltage depends upon the positions of the current and potential electrodes with respect to the target as well as the earth’s conductivity. Obtaining information about the spatial distribution of conductivity requires many measurements at different locations and electrode configurations. A Schlumberger survey involving two current and two potential electrodes is shown in Fig. 149. 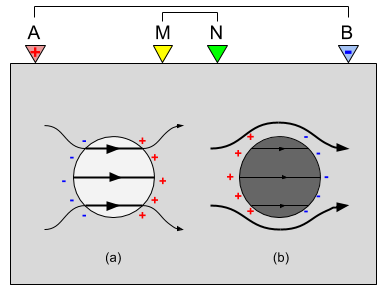 Artistic representation of the current density and charge build-ups are illustrated for (a) conductive and (b) resistive spheres in a uniform half-space.